As most of you will know, in my last job I worked at my local Outfit store. I worked for the company since leaving school and lasted almost seven years there, so naturally I have a big soft spot for the brands stocked there. After spotting on Twitter last week that their site had just had a revamp, I decided to browse the brands and see what was in the current collections. 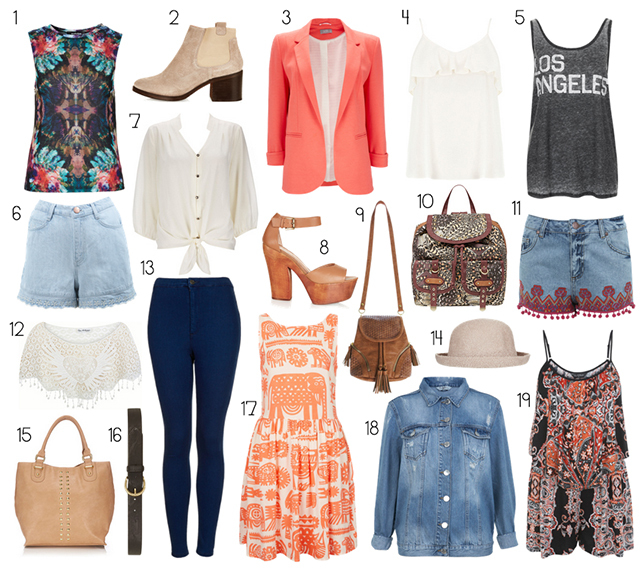 I came across loads of pretty things so I thought I’d cram them all into a big wishlist post! There’s a good mix of brands below, including the usual Topshop and Miss Selfridge items, but also some surprises from Dorothy Perkins and even Wallis. They’re not the kind of brands a girl my age would normally shop in, or even think to go in really, but having worked with the brands for so long I always used to spot things that were really on trend. It’s definitely worth having a look as they are some real gems! At first glance you can’t really tell which brand is item is from, which is what I love about Outfit. A lot of people never really seem to have heard of Outfit unless they live near a store, but basically they are stores that house all the Arcadia brands (Topshop, Miss Selfridge, Dorothy Perkins, Wallis, Evans, Topman, Burton) under one roof, and their motto is ‘Behind every story is an Outfit story’. As you can probably tell, I’m really into the whole bright, Eastern inspired trend that’s out there at the moment. I love all the oranges and reds and the unusual prints that have a Moroccan feel to them. Teamed with a good helping of denim and tan accessories, I think this is defeinitely my favourite trend for SS13. Have you shopped in an Outfit store before? "NORTH WEST BLOGGER MEET UP"
I do rather like that orange animal print dress from Topshop..May have to be adding that to my summer wardrobe.. Awesome picks of latest fashion clothes.. Loved all..! !